Football is part of my genetic makeup, and football season is part of what makes the South a special place to live. We cherish the season that has us memorizing schedules and rosters, picking out cute game day attire, planning tailgate menus weeks in advance, and making us feel like we are indefinitely a college student. Even if you're not a Southerner, it's hard to imagine a region of America that doesn't get excited about this time of year. I was raised by a 40 year veteran football coach, who never played a down himself, but taught his players and his own children to give it your all. He nurtured young people to compete fairly, play hard, and be the best person that you can be. I think these are such valuable life lessons on and off the field. I came across this great little book about all those lessons and more. 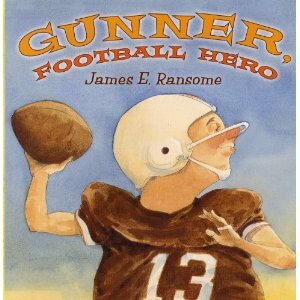 Gunner, Football Hero by James E. Ransome follows the lofty ambitions of a young boy who just wants to play football. He makes the Pee Wee football team as the third string quarterback, but spends more time on the bench than throwing any passes. However, the story is about so much more than the obvious and has a fourth quarter thrill of an ending! This is a great read for all age groups, especially during this time of year. While we're on the subject of football, who doesn't love the concession stand food? Your kids will get a kick out of listening to this story while enjoying some popcorn! 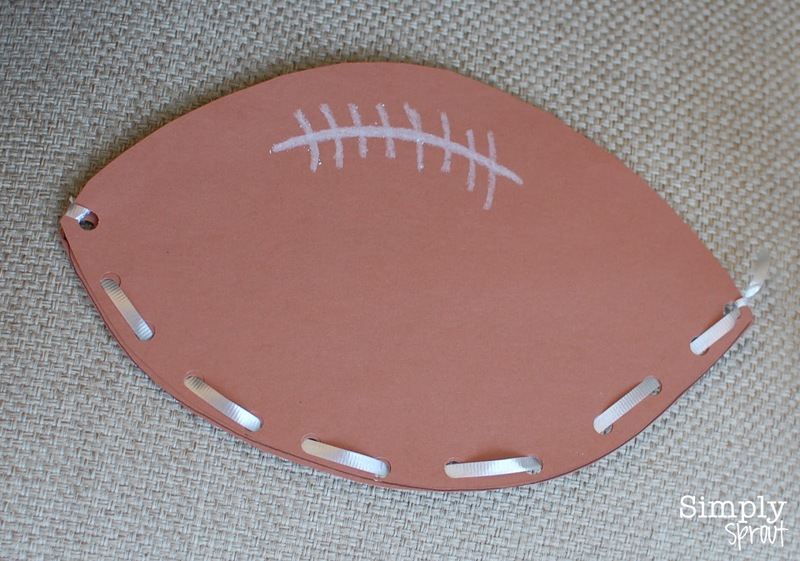 Make a football stencil on a file folder, and have students trace it on two sheets of brown paper. After cutting the two pieces out, have them use a hole puncher to punch holes along the bottom of the football. Pass out white ribbon or yarn and have them practice their fine motor skills by lacing it through the holes. Tie a knot at both ends. We used a white crayon to draw a football's eight laces. Instead of popcorn you could have students fill the football with adjectives that describe someone with good sportsmanship. It's important to teach children that competition can be fun and build strong character! Marcy and I cheer for opposing teams, but we know in the end that having fun on Saturdays is what matters most! 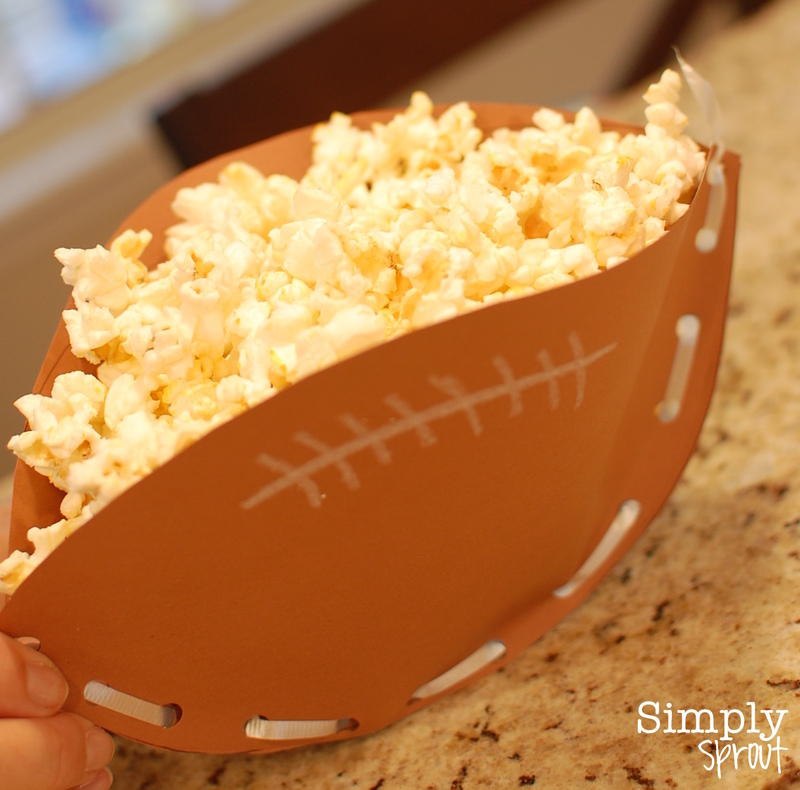 Ok, that popcorn bowl is just the cutest thing. How perfect for this season. I would love for you to share this at our Fall Bucket List link-up. It's open all month for all things fall and family, and this is perfect! Oh my gosh I love this idea! And I think my husband will too if it helps my 2 year old sit still next to him on Sundays! !